The William Blake Archive is pleased to announce the publication of an electronic edition of Blake’s etchings/engravings of John Flaxman’s Compositions from the Works Days and Theogony of Hesiod (1817). Both the designs and the inscribed texts are fully searchable. The thirty-seven Hesiod plates are one of Blake’s major endeavors as a commercial etcher/engraver of designs by other artists. Flaxman began to sketch designs based on Hesiod’s poems in the early 1790s, but it was not until February 1816 that he entered into a contract with Longman & Co. to compose a series of illustrations for publication. Blake had already been commissioned to execute the plates, almost certainly on the recommendation of Flaxman, a friend of many years. The publisher began to receive proof impressions in November 1814; the project was completed by January 1817. Blake, who received very few other engraving commissions during this period, was paid 5 guineas (£5.5s.) for each plate, a total of £194.5s. Without the Hesiod project, Blake and his wife Catherine might have descended into dire poverty. Blake executed the Hesiod illustrations in an unusual graphic style. 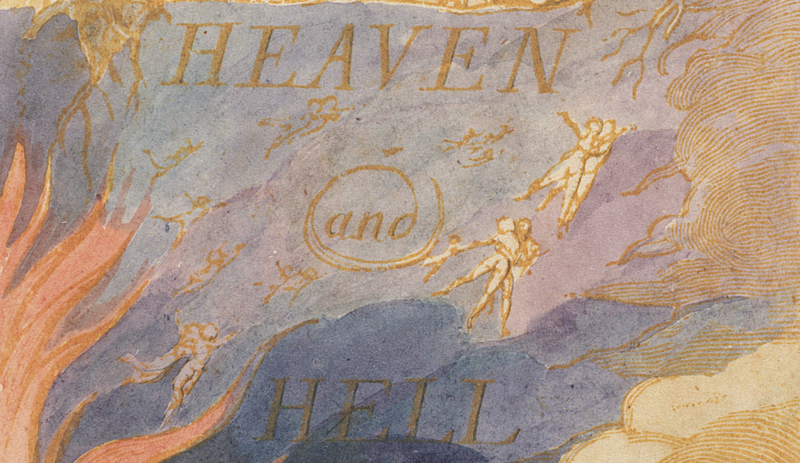 Rather than continuous outlines, found in the engravings of Flaxman’s other classical compositions, Blake used stippled lines—that is, lines composed of dots. It is surprising to see Blake, who wrote in a letter of 1827 that “a Line is a Line in its Minutest Subdivision[s],” deploying a technique that divides lines into points. Perhaps he was responding to the character of Flaxman’s preliminary drawings, now untraced, upon which the etchings/engravings were based. If these were in soft pencil, then stippled lines would be an appropriate equivalent. It is also possible that Flaxman or his publisher directed Blake to use this style. Flaxman’s classical compositions were influenced by, and often understood as recreations of, Greek and Etruscan vase paintings. His illustrations of Homer’s Iliad and Odyssey and of Dante’s Divine Comedy were published, or at least engraved, in 1793. They soon became famous and highly influential throughout Europe. These were followed by designs for the tragedies of Aeschylus in 1795 and Blake’s Hesiod engravings in 1817. Blake also contributed three plates to the 1805 revised publication of the Iliad illustrations; these are forthcoming in the Archive.